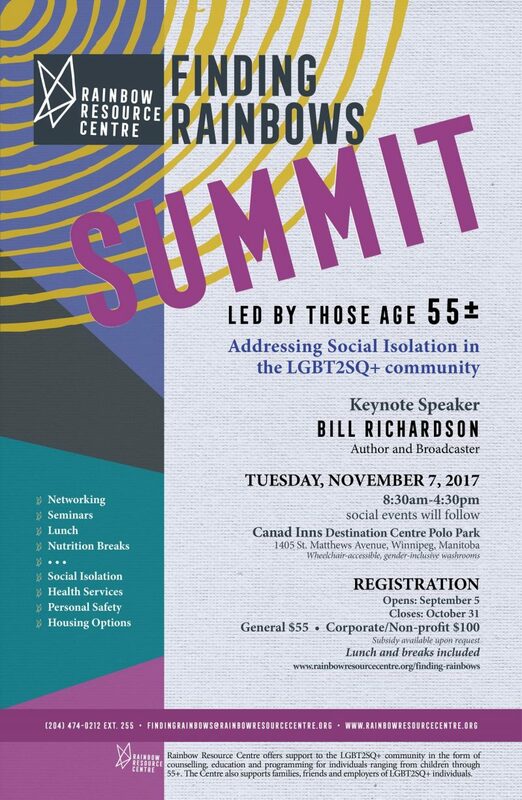 The Finding Rainbows Summit was held on Tuesday, November 7, 2017 at Canada Inns Destination Centre Polo Park. Downloads of information and resources from the Finding Rainbows Summit will be uploaded to this webpage soon -- please check back here for these resources. The Finding Rainbows project, sponsored by Rainbow Resource Centre, is funded in part by New Horizons for Seniors Program. Recognizing the Senior LGBT2SQ+ community is heavily underserved, and lacks programming to address specific needs, the project will offer a space that allows community members to connect, share their experiences, and express their needs. The project is organized and led by LGBT2SQ+ adults who are 55 and older. A needs assessment related to LGBT2SQ+ aging, the results of which will be used to identify conference topics.